Free shipping. Buy direct from HP. 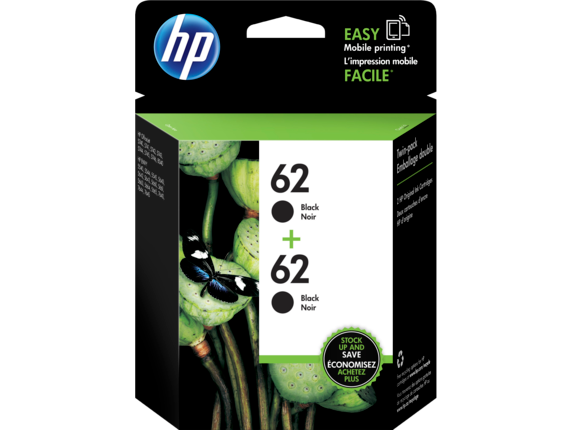 See customer reviews and comparisons for the HP 62 2-pack Black Original Ink Cartridges. Upgrades and savings on select products. Original HP ink cartridges reliably deliver durable documents page after page. HP ink cartridges are specially designed to work with your HP printer for projects at home, work, and school. Make an impression with Original HP inks—designed to consistently deliver high-quality black text.Show off your printing projects. Create documents you’ll be proud to share—using Original HP inks.Rely on Original HP inks for durable prints that resist fading, water and smearing. 1 Water, smear, and fade resistance based on ISO 11798 and internal HP testing. For details, see http://www.hp.com/go/printpermanence. 2 HP Planet Partners Program availability varies. For more information, visit http://www.hp.com/recycle. 3 Based on HP 62XL High Yield Black Original Ink Cartridge and HP 62XL High Yield Tri-color Original Ink Cartridges. For more information, see http://www.hp.com/go/learnaboutsupplies. High-yield cartridges not included; please purchase separately. Value compared with estimated street price and page yield of standard-yield HP 62 ink cartridges. Actual pricing may vary. 4 Compared with individual HP ink cartridges. Based on estimated U.S. street price. Actual retail pricing may vary.